EuroMillions is a European multinational lottery. The game is facilitated by a British company, but it can also be played via the partners in Italy, Ireland, Spain, France and Germany. Thanks to this interconnection the jackpot, which is common, can be huge and grow rapidly. What is the probability to win the main prize and the player’s expected return? In the lottery game EuroMillions there are five (5) balls drawn out of fifty (50) and two (2) lucky stars out of eleven (11). There are 13 different prizes according to the match with the drawn five regular numbers and two lucky stars (if you managed to win, you would not consider 13 to be an unlucky number). In other words the prizes are ordered by the probability or the odds of winning the prizes. To get the top prize one needs to match all 5 balls (out of the 5 balls drawn and out of the total 50 balls) and both two lucky stars (out of the 2 stars drawn and out of the total 11 lucky stars). The draw takes place twice a week on Tuesday and Friday evening. A bet (one line) costs 2 pounds or euros in respective countries. The wins are stipulated in British pounds or in euros. The minimum guaranteed jackpot is 15 million euro. However the recent average prize (recounted after each draw), as we can see at the table below, is greater: £44,375,315. All important information and calculations related to the EuroMillions lottery are shown in the Table 1. Let us have a look at the meanings of table headings one by one. We can see the 13 Prizes that can be won according to the Match, whereas the first number stands for regular balls and the second number stands for the lucky stars. The Price Fund shows a percentage allocations to each prize. We can notice that the biggest part goes for the top prize and also that a good deal of prize fund is allocated to the lowest prizes. That is likely due to psychological reasons. The lottery players should not be leaving empty-handed too often and thus have motivation to keep on betting and striving for the dream jackpot. If you were suspicious and added up the figures, you would get the total of 91%. That is perfectly alright as the remaining 9% is used to boost up the jackpot to quickly reach the minimum 15 million euros. The Average Prizes are published by the lottery operator and the figures are updated after each draw. The column “…as a multiple” is auxiliary for further calculations, but it shows how many times you can capitalize on your initial bet (2 pounds). The multiples are stated as net in the following way: (Average Prize minus 2 pounds) divided by 2 pounds. The multiple -1× represents the loss of the bet. The Probability of winning (and losing as well) in the EuroMillions lottery, especially as for the main prize, is an interesting indicator for sure. In mathematic or statistic point of view, the probability is usually shown as a decimal value. However in case of low probabilities they may look unclear, hard to understand or it is necessary to count the zeros. That’s why it is better to show the probabilities as the Odds that is in the format “1 in …”. The odds are reciprocals of the probabilities. The odds of winning the top prize in EuroMillions are approx. 1 in almost 117 million. At the same time, 117 million is a count of unique combinations that can be created when drawing 5 balls out of 50 and 2 lucky stars out of 11. We can use this Excel function: =COMBIN(50,5)*COMBIN(11,2) = 116,531,800. 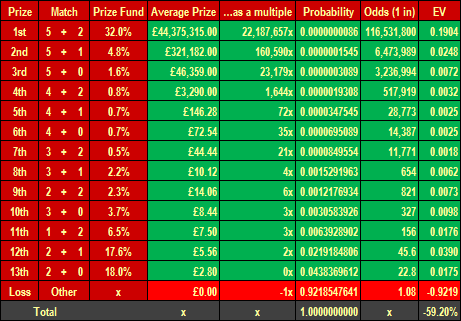 The probability or the odds of not leaving empty-handed, that is to gain any of the 13 prizes, can be gotten by adding up the green-background figures in the column Probability and we arrive at the value of approx. 0.078 (7.8%) or 1:13 as the odds. To win the top prize in EuroMillions, as well as in any other lottery, is not very probable, but not impossible. It is a question of luck or chance. On the other hand we are also interested in where our betting efforts are going to head on average in the long run. This is to be answered by the concept of expected value (EV) – see the last column of the Table 1. The expected value, or the expected return from the player’s point of view, weights possible prizes (as well as the loss of the initial bet) by their probabilities. We have already calculated them and we have also known the average prizes. The resulting value -59.2% shows that as a player we are going to lose about 59 pennies out of each pound inserted in the game. They, on the contrary, are going to be received by the lottery company and this is their margin on the EuroMillions lottery. This long-term margin (59%), calculated on the basis of the published average prizes, seems to be higher than usual. However there are also positives on EuroMillions. The lower average long-term winning chances are balanced by huge jackpots and also by the way the jackpot is handled. The jackpot keeps on rising, however there are two exceptions (source). The minimum guaranteed jackpot in EuroMillions is 15 million euros, but there is also a maximum value or a cap. When the jackpot reaches 190 million euros, it is capped at this level and kept for next two draws. If the jackpot is not hit, that is nobody wins the top prize, the jackpot is shared among the players who reach the next highest prize, i.e. the 5 + 1 match (the main prize is 5 + 2 match). Eventually if there were no winners either, the jackpot would be divided among the third prize winners (5 + 0) etc. In any case there can also be a single winner, but with the lower prizes the probability rises. This (capped) jackpot division rule is very sympathetic for players. Similar rule applies for occasional superdraws. Therefore the jackpot is always distributed among the most successful players (there can be only one) at the last draw. Another multinational lottery EuroJackpot is worth mentioning. Its jackpot is also raised by undistributed prizes, but its maximum value is not limited (since 1 February 2013)! That means the jackpot grows steadily until it is not hit by any player. It may take some time, but the winning probability is about twice higher than in case of EuroMillions. Other resources: www.hazardni-hry.eu/loterie/euromillions.html (original Czech article).